Walt Disney quotes are statements Walt made during his lifetime. They include his comments on his dreams, his ideals, his philosophy on life & his hope for a better world. Like other self-made entrepreneurs, Walt believed in following his dreams, along with determination, focus, hard work, and building a team of motivated employees to make his dreams come true. One important trait that stands out in Walt is his respect for other people, family & friends and especially for the public. 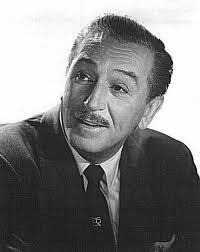 -that delivering a great product, which the public would truly appreciate was paramount to Walt. As you read these Walt Disney quotes, you start to see his strong belief that by applying his philosophy-- that just about anything that the human mind can imagine-- is possible. It is good to have a failure while you are young because it teaches you so much. You're never quite as vulnerable afterwards. in the entertainment for the masses. But wide awake, not blind faith, moves me. Though most of us lose it as we grow older. Sometimes, as I look back on how tough things were, I wonder if I'd go through it again. And one thing it takes to accomplish something is courage. The way we get started is to quit talking and begin doing. and whose respect we need. It's just according to the way you look at things. but it doesn't mean you have to have wealth. And you'll find people who are eager to fill your head with information. It might be appropriate to say I believe in my lucky star. But I reject "luck" I feel every person creates his "determinism"
By discovering his best aptitudes and following them undeviatingly. Never get bored or cynical. Yesterday is a thing of the past. all have a keen respect for the public. If you've done the very best you can, worrying won't make it better. I worry about many things, but not about water over the dam.